Like it or not, “vintage is in” – and while that promises plenty of tried and tested classic design elements and whatnot, many still struggle with getting this vintage revival thing right. 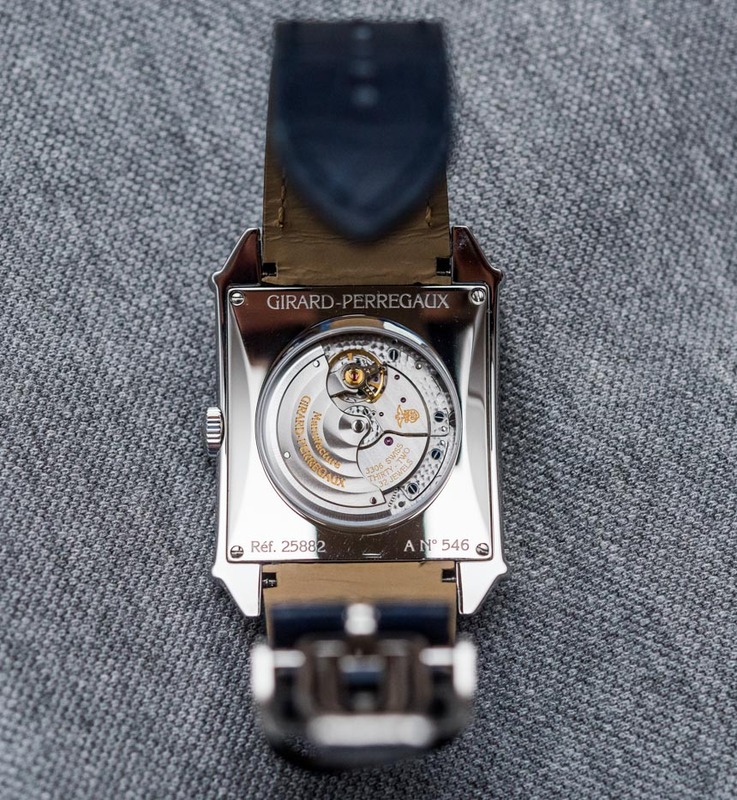 The Girard-Perregaux Vintage 1945 XXL Large Date And Moon Phases (yes, that’s the full name) is a refreshing drop in the ocean of repetitive, often not very interesting vintage-revival or vintage-inspired watches. In fact, if the brand debuted it just this year, it would still be a very interesting contender among high-end wrist watches. Let’s see what makes the Vintage 1945 special – even if it is not without its minor flaws. 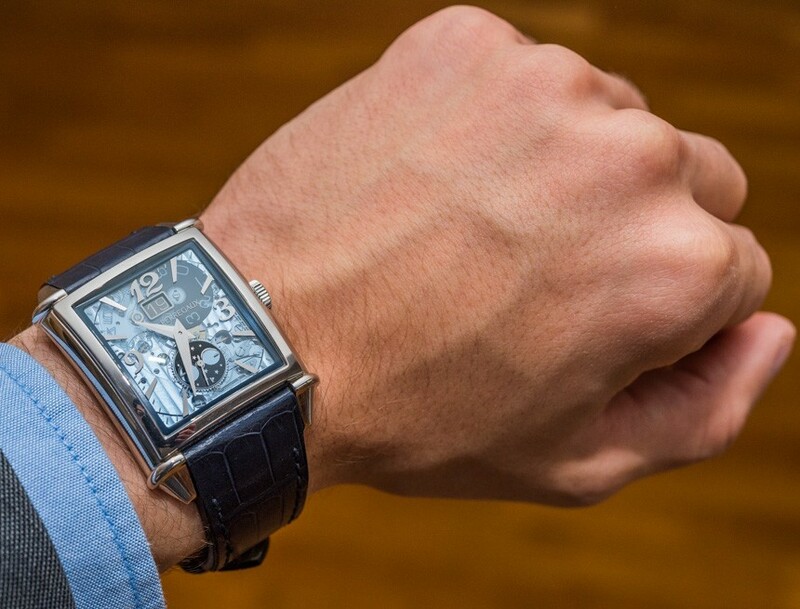 As the name implies, Girard-Perregaux originally conceived this piece back in the 1940s, with the reference 5418 and 5420 being some of the first to debut this rectangular, and yet rather sensible-looking design. 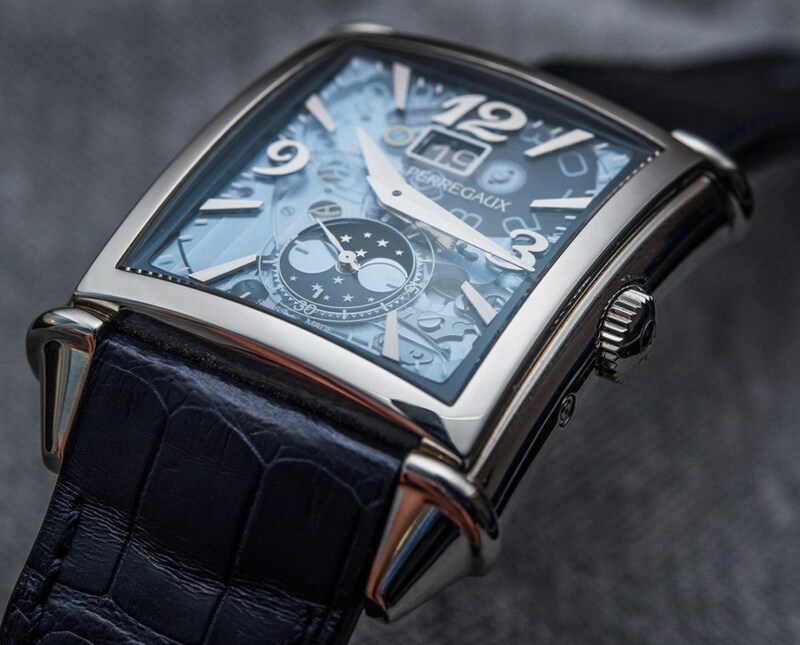 Fast forward seventy years, and what you get with the Girard-Perregaux Vintage 1945 XXL Large Date And Moon Phases is a larger 36.10mm by 35.25mm-wide and 11.74mm-thick case – do bear in mind, though, that the lug-to-lug size on this “XXL” model is actually right around 50mm, which although isn’t large per se, it is very much in line with the trends of our modern times. Refreshingly, the beauty, in this instance, is not just skin deep and, in fact, not without function. Upon closer inspection of the images above, you should see that the case of the Girard-Perregaux Vintage 1945 XXL Large Date And Moon Phases exposes some beautifully curved lines. The concave case back follows the sloping profile of the case and flows into the short, angular lugs. Adding to the curvaceous looks, the shape of the crystal – which is more of an elongated, rectangular dome than anything else – merges with the sloping edges of the bezel. The overall effect is that of an item that offers just the right mix of angular, more masculine design elements and smooth surfaces. 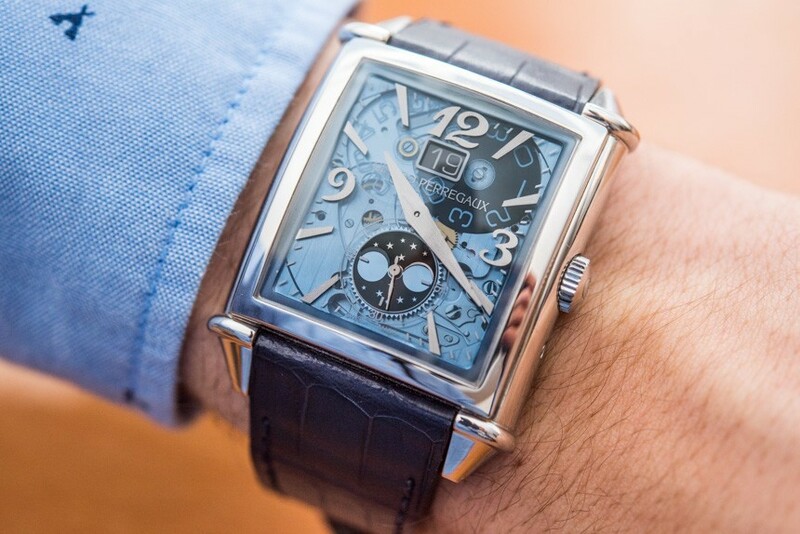 It has to be said, though, that because of the peculiar domed shape of the crystal, the Girard-Perregaux Vintage 1945 XXL Large Date And Moon Phases is extremely difficult to photograph – no matter what angle you hold it at, light will hit the crystal from some direction and create a bright reflection on it. Nevertheless, the case shape’s strong points far outweigh the issues concerning photography – we will discuss the watch’s actual legibility just a bit later. 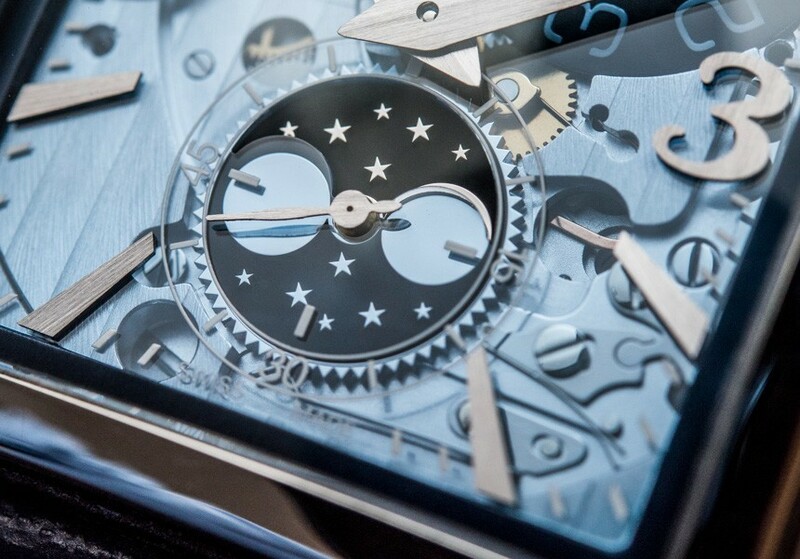 A point that is hardly ever a particularly new or strong attribute of most watches is the way the case feels to the touch. 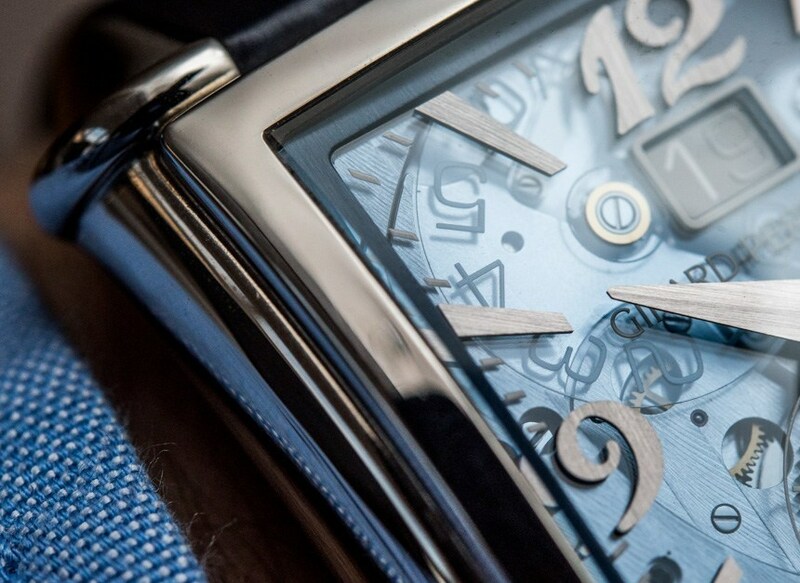 Many modern watches have a number of sharp angles either around the lugs, the crown, or even the bezel sometimes, and these parts of the case are often genuinely uncomfortable or even painful to interact with. 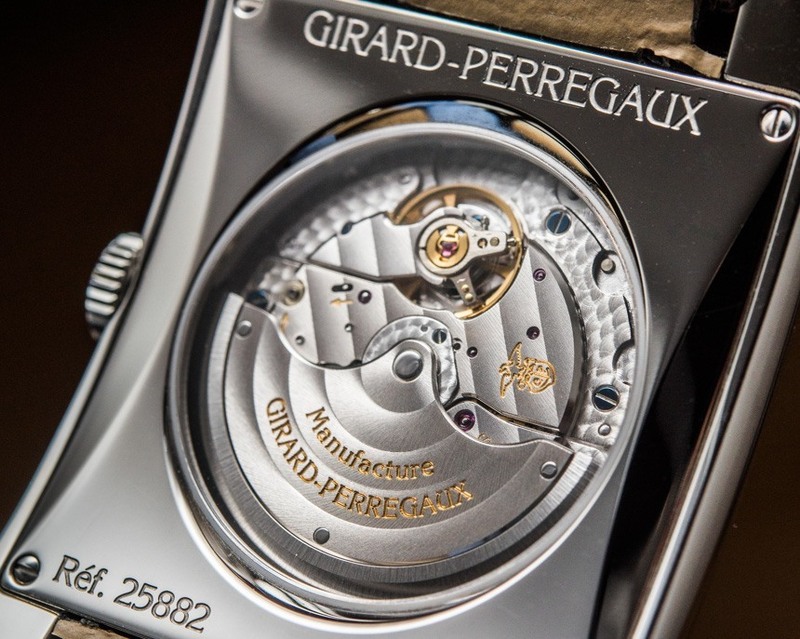 By contrast, on some occasions, I found myself to be subconsciously resting my right hand on the watch, as the high-polished steel case and its flowing curves simply rendered the Girard Perregaux Vintage 1945 XXL an object beautiful to hold as well as to behold. Come to think of it, all these smooth surfaces remind me of pebbles one can find on river banks, after the fierce flow of water has worn the stones perfectly smooth. 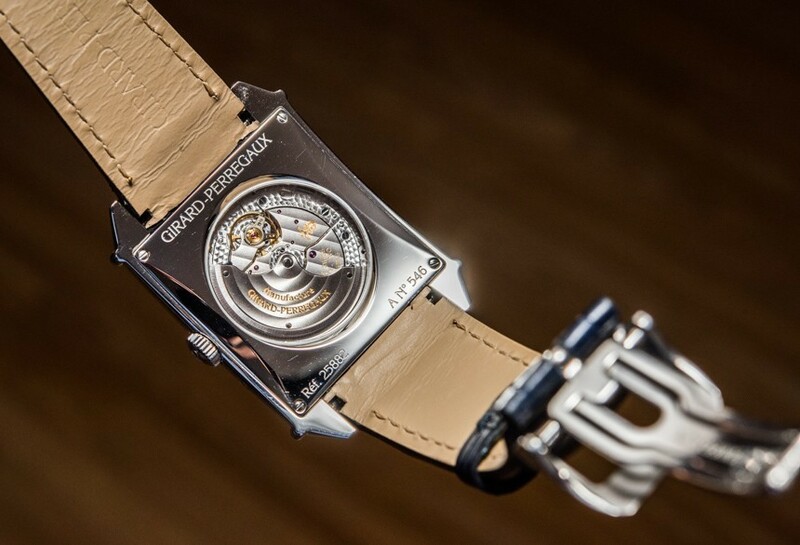 Beyond its case shape that follows the shape of the wrist – which, on a side note, makes one wish that such ergonomic design elements were more common and not that revolutionary these days – the Girard-Perregaux Vintage 1945 XXL Large Date And Moon Phases is also remarkably comfortable to wear thanks to its strap. 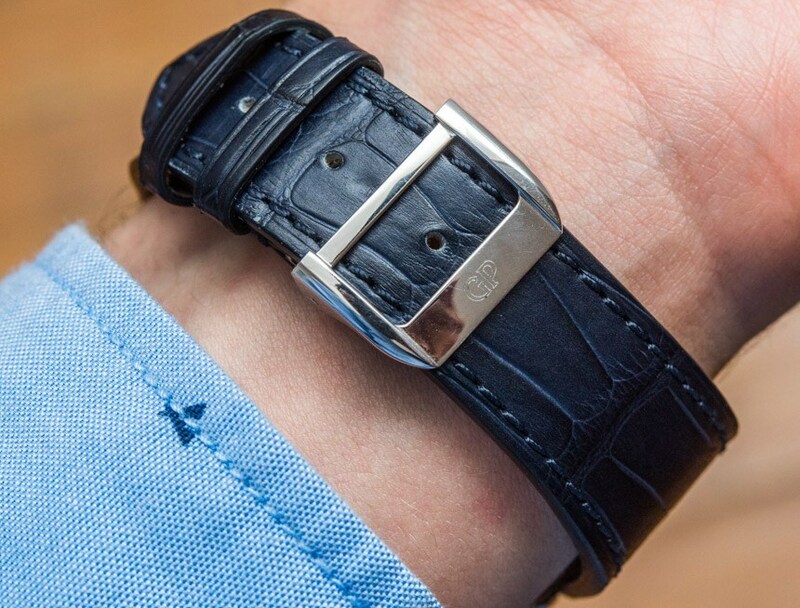 Specifically, it is not just the supple alligator strap and the easy-to-use folding buckle that make a noticeable difference, but more so the way the strap has been integrated into the design of the case. In fact, the integration at the point where the strap meets the lugs and the case is so well done that it is on par with what is in the majority of times exclusive to steel bracelets and some more expensive rubber strap designs. 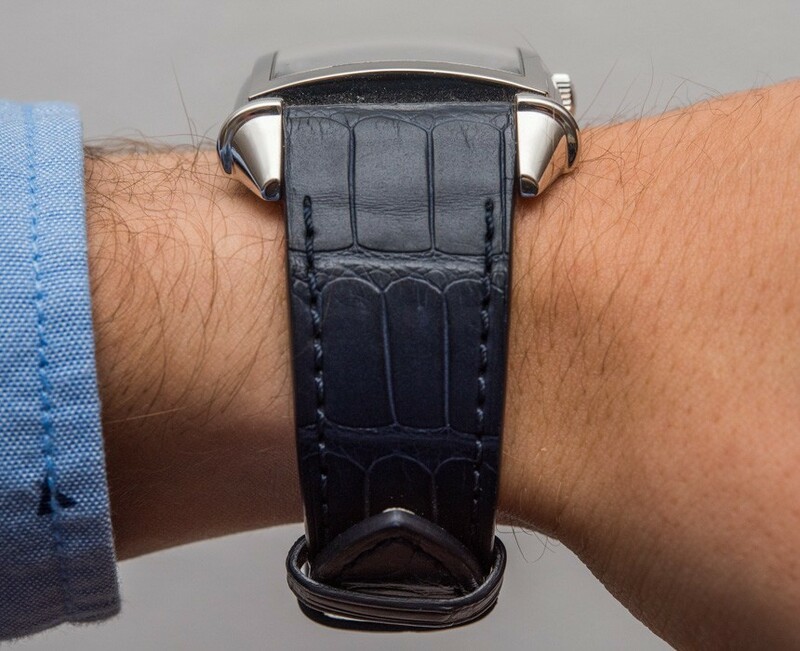 Perhaps not something you would expect from a vintage inspired watch, the reason such seamless strap integration is so important is that a watch’s fit and wearability seems to magically improve tenfold thanks to this feature. To be fair, there are comfortable-to-wear watches with traditional lug and strap designs, but in my experience, such integration tends to be superior not just when it comes to looks, but also wearability. 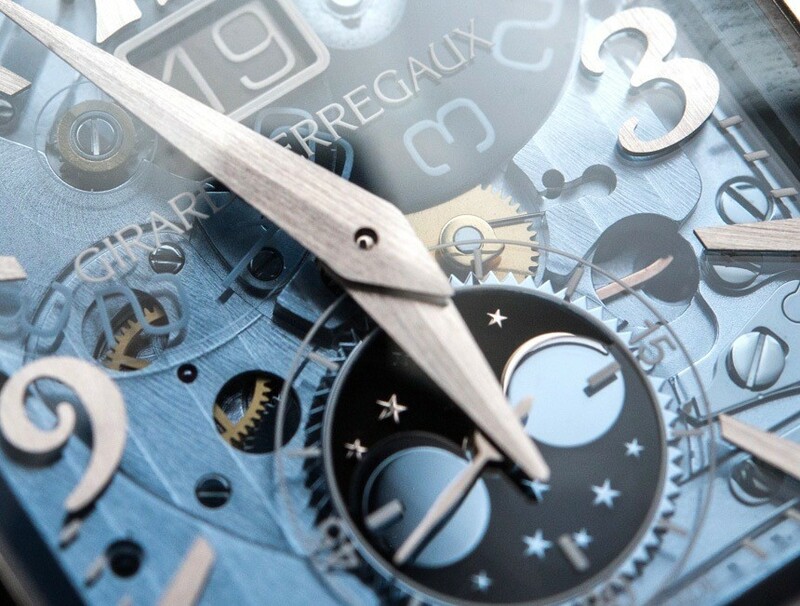 The visual centerpiece of the Girard-Perregaux Vintage 1945 XXL Large Date And Moon Phases watch has to be its fantastic dial, crafted from a single piece of sapphire crystal and colored to a translucent, often barely noticeable, other times very defined blue. 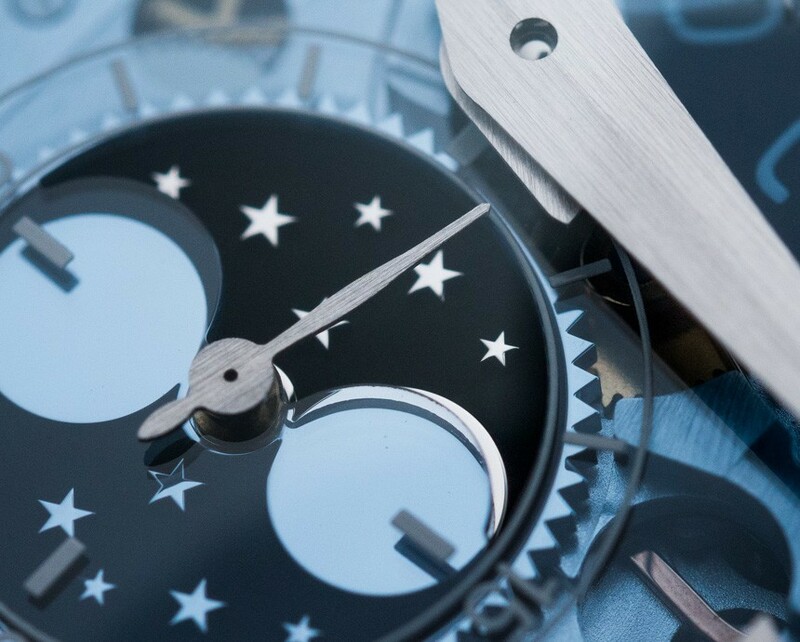 This design modification of omitting a solid dial and replacing it with a transparent one, makes a world of a difference in styling and overall aesthetics. 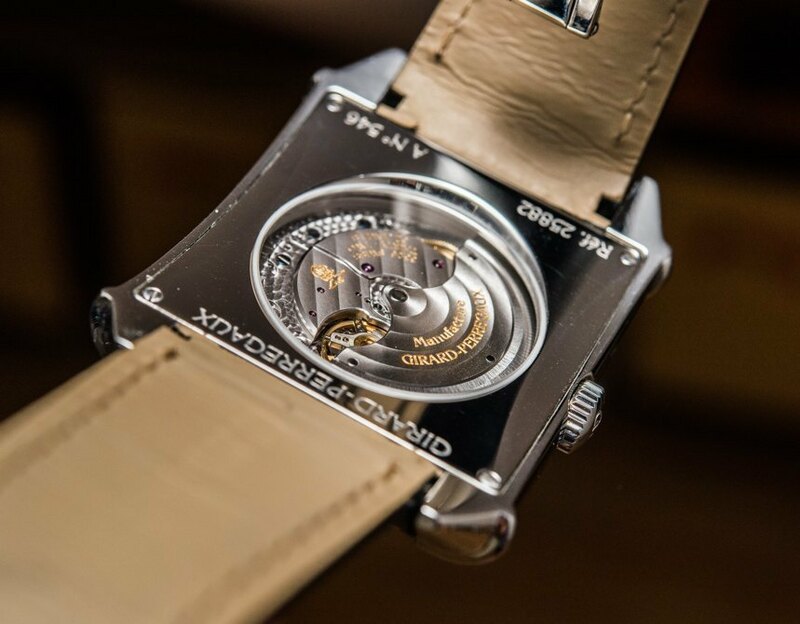 The inner workings of the large date and moon phase module of the GP03300-0105 automatic caliber are revealed – and revealed in a clever way that does a good job at disguising the fact that a round movement has been fitted to a rectangular case. 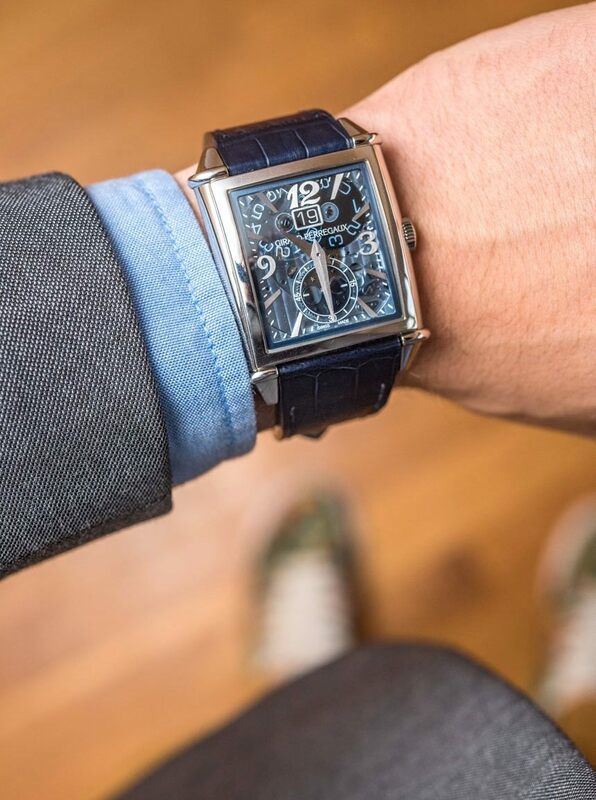 The blue adds a lot of personality to the watch – however, should you find this vibrant sky blue and blue strap combination a tad too much, there is another steel version with a grey-colored sapphire dial (hands-on here), along with the more traditional, solid dial options as well, of course. 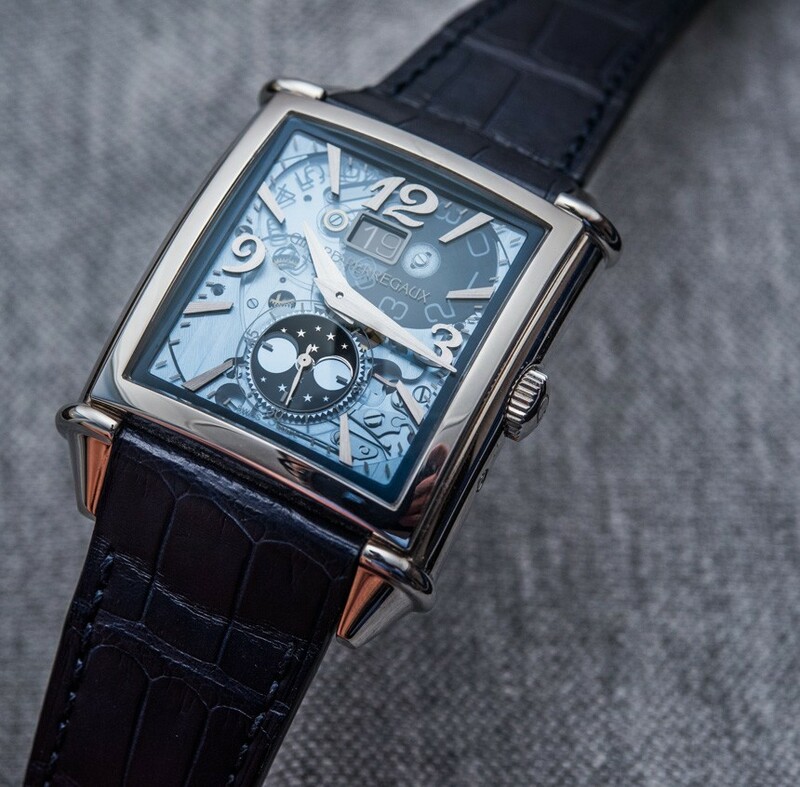 It may not be obvious from the images, but in daily wear, the subtle blue transparence of the dial works beautifully with the “vintage vibe,” not damaging it but rather just getting up to pace with our visually more vibrant times. 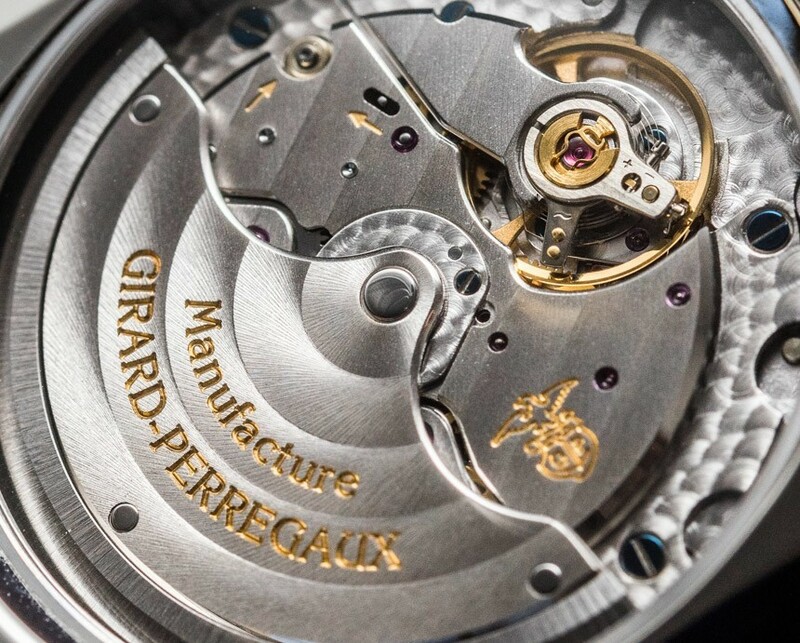 One can tell that Girard-Perregaux recognized the importance of legibility – after all, who would you expect to at least try and get this right if not a manufacture with the date 1791 in its title. The indices are large, almost “oversized” for what they are, while the central hour and minute hands are also, thankfully, as large as they can possibly be! 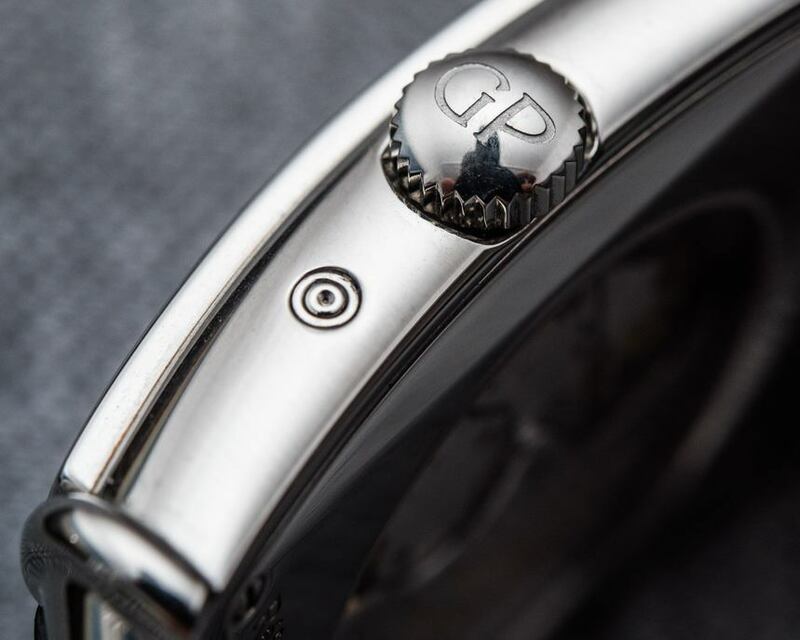 GP even put the effort into creating the extremely precise cut-out for the large date and moon phase displays, so that there are no additional reflections to hinder legibility of these indications – a small but very important detail that must have been a real pain in the neck to engineer. 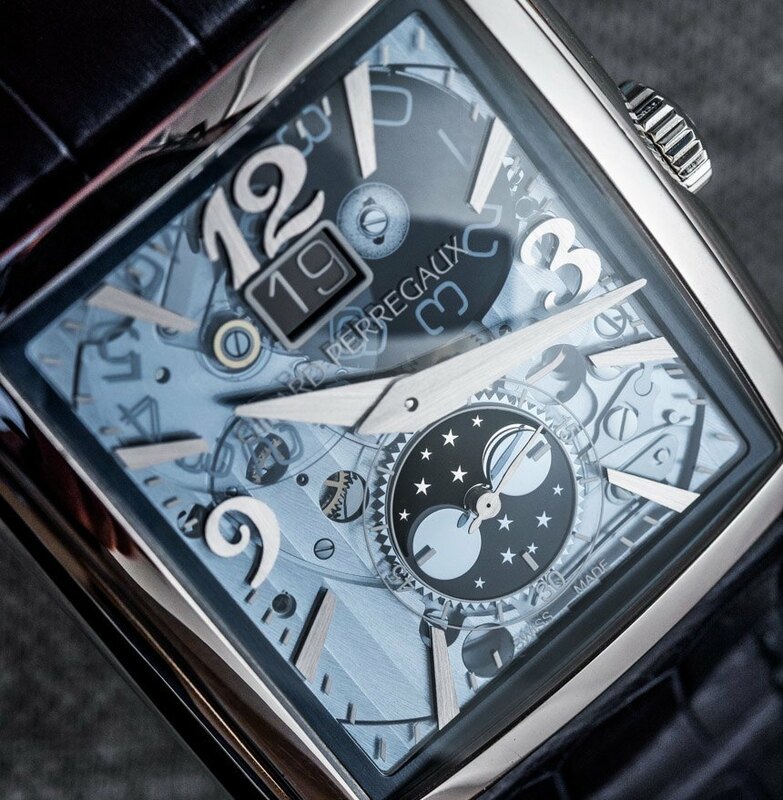 Still, legibility is where the Girard-Perregaux Vintage 1945 XXL Large Date And Moon Phases falls a bit short of scoring maximum points but, interestingly, the source of the problem is not the stunning sapphire dial, but the hands. Both the hour and minute hands are faceted, which means that they have a fine but visible edge running through their entire length. 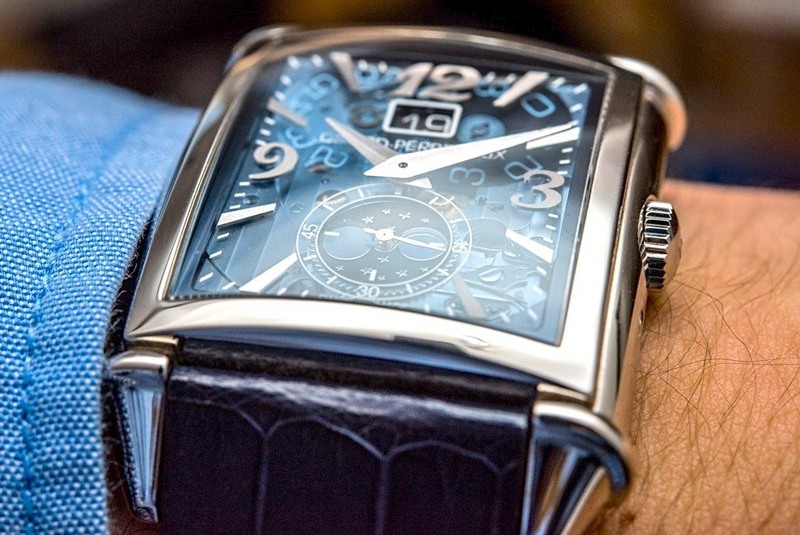 This implies high quality hands and indeed, they clearly are not anything like the cheaper stamped ones that have been working their way up the price segments and into some luxury watches of late. 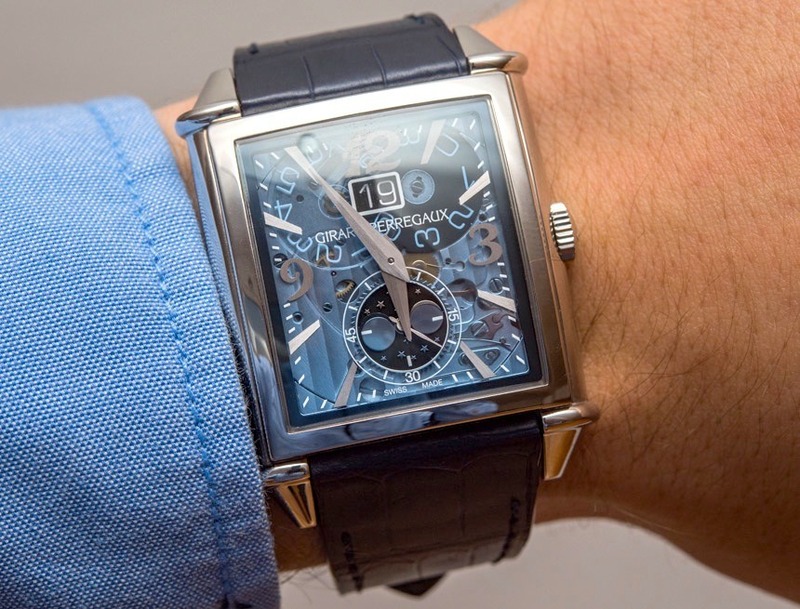 The problem is that both facets are brushed and, as captured in the image above, light often can fall on one or both in a way that they don’t reflect much light back, allowing the hand to blend into the background – and again, the backdrop could be a black or grey solid dial and the issue would remain, so it is not the sapphire dial’s fault. The solution would have been to polish one and brush the other facet of the hand, so under all circumstances at least one side of the hand would reflect light. As they are now, however, I frequently found myself looking for the hour or minute hand and not being able to determine their position until I spent quite a bit of time moving the watch around. With this issue under some lighting situations aside, legibility really is as good as it can be on a watch with a transparent dial, thanks to the properly sized hands and applied indices. Nothing, it could be said, is wrong about the movement, though: the base GP 3300 is a high-end workhorse caliber and that shows. All engravings and decorations are of high quality as far as more run-of-the-mill calibers are concerned. All surfaces have been extensively covered with perlage and Geneva stripes, while all logos and text show up in gold. This particular movement is the GP03300-0105 and beyond the hours, minutes, and small running seconds, it offers phase of the moon and a large “digital date” indications. Here’s one more thing you don’t hear every day: the case back looks amazing. The middle section of the case back is curved lengthwise and sidewise, and two smaller curves have also been added on each side of it to make the profile of the case visually smaller. Not even this elongated curve helps with the operation of the small crown, however: even with the watch off the wrist, it is rather tedious to grab ahold of and manipulate the small crown, which I wish was but a bit larger and easier to hold. The overall appearance of the back is as impressive as that of the front – I am glad the crystal on the back has not been colored blue but is crystal clear. (See what I did there?) A limited amount of text, a perfectly circular window in the center, and large, high-polished surfaces make the case back a fitting frame for the automatic caliber. >Would reviewer personally wear it: Yes. >Friend we’d recommend it to first: Guy who loves vintage dress watches and is happy to wear a modern take on a classic. >Best characteristic of watch: Terrific and comfortable to wear while having a timelessly beautiful design, highlighted by a cool and nicely detailed sapphire dial. 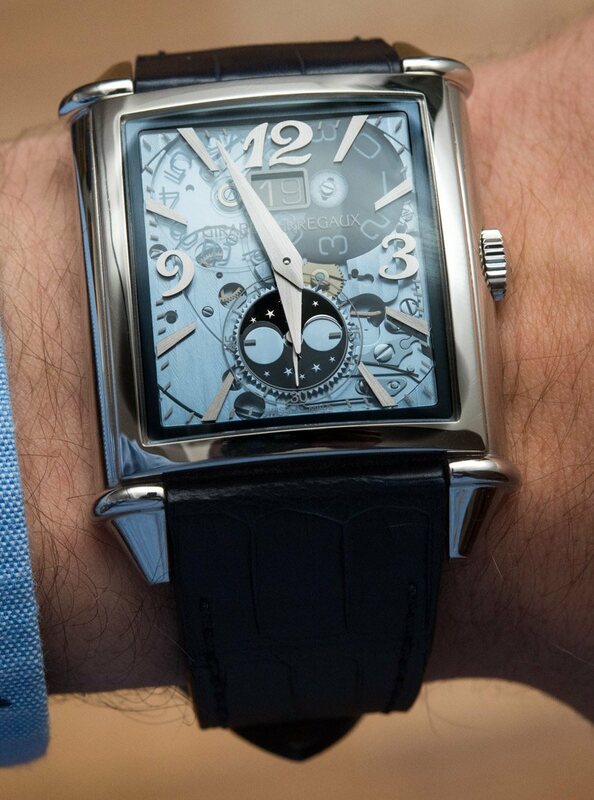 >Worst characteristic of watch: Finishing on hands causes legibility issues under some circumstances.